First of all, a primary difference between the two revolutions was that the Chinese Revolution occured much later and lasted much longer than the Russian Revolution. Communism triumphed in China in 1949, 30 years after the Russian Revolution. The Chinese Revolution lasted about 28 years, while the Russian Revolution only lasted about one year. The reason for this difference is because the ideas of Karl Marx (which inspired the movement in Russia) were barely known in China in the early 1900s. In Russia, intellectuals had been discussing socialism for half a century, so when the time came, Vladimir Lenin knew the revolution must happen. It was rapid and successful, so it only lasted a short time. In China, it took a long time for the communist party to build up. The revolution was slower because there was less industrialization and social unrest. Not until the Chinese Communist Party formed were the Marxist strategies practiced. Another difference is who the activists in each of the revolutions looked to for support. In Russia, the Bolshevik's primary audience was workers in Russia's major cities. Industrialization had been causing major unrest in the cities, which is why the revolutionaries knew it must be them who they appealed to. This unrest, combined with efforts from the Bolsheviks, led to the revolution in 1917. In China, the peasants of the rural countryside took up most of the population. At this time, China's industrial base was much smaller than Russia's so they didn't have as many urban workers. The Guomindang, a nationalist party ruling China at the time, did little to help the rural areas of the country. The Chinese Communist Party impressed the peasants with their military strategies, promised land reform, and empowerment of women. The Russian and Chinese Revolutions also contrast in their military strategies they used to gain support. In Russia, the Bolsheviks gained support by urging Russian withdrawal from the first World War, which had caused so much damage an unrest from the people. 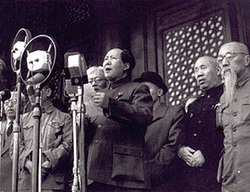 In China, the communist party gained support by aggressively pursuing the struggle against Japanese invaders during World War II. The reason for this difference in unification. The Bolsheviks knew that their targeted supporters would become unified in their effort to withdrawal from World War I, while the Chinese knew that their people would become unified by counter-attacking the Japanese in their invasion and overthrowing the current government (the Guomindang), giving the large peasant population more power and decreasing the poverty. Of even more importance are the similarities between the Russian and Chinese Revolutions. First of all, despite the time gap between the revolutions, they both occured at the end of the two world wars. The Russian Revolution of 1917 occured only a year before the end of World War II. The Chinese Revolution of 1949 occurred just a few years after the end of World War II. The reason for this similarity is because the wars hit both countries hard. Although different in their strategies (Russian trying to withdraw while China trying to act aggressively in order to put an end to it), the war had a similar affect on both countries. Impoversished, exploited peasants and wealthy landlord classes had already suffered increased tension, and the wars just helped to spark these revolutions. Also, the leaders of the revolutions were able to blame their failing performances in each war on the political structures they wanted to overtrhow, strengthening their campaigns further. Another similarity is that both revolutions were led by charismatic leaders. China was under the leadership of Mao Zedong, while Russia had Vladimir Lenin. Both of these men knew that change was needed in their countries, and they were able to convince large amoung of people that it was time for a socialist revolution. Both of these leaders spoke very convincingly, and had smart, persuasive tactics necessary in any leader. After triumphing in their revolts, both leaders pursued a direct attack on the long-standing inequalities of class and gender. They also encouraged modernization and industrialization of their societies. The Russian and Chinese Revolutions also compare in the fact that they both wanted to spread their communist ideals to other countries. Russia wanted to spread their views to Cuba, Poland, Hungary, Korea, and more. In China, they wanted their ideas to spread to Vietnam. The reason for this similarity is because both countries wanted more power, and the more political influence a nation has, the more powerful the nation becomes. The new communist regimes wanted as much influence as the emerging Western powers, so they wanted their views to be spread. Strayer, Robert W. Ways of the World: A Global History with Sources. Boston: Bedford/St. Martin's, n.d. Print.